Stanley Park can be found bordering the downtown area of Vancouver British Columbia Canada. It’s a 1,001 acre park made up from a mixture of park land, forest and seawall. It opened in 1888 and was named after Lord Stanley of Preston who served as Colonial Secretary at the time. It’s a incredible place to visit. You can stroll through the future landscape of downtown Vancouver and within minutes be in the heart of a forest with an estimated half a million trees. 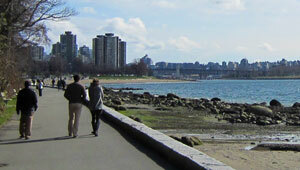 Stanley Park attracts people for its natural beauty but also for its wide range of leisure activities. While we were there we saws hundreds of cyclists and joggers taking advantage of the unseasonable good weather. With clearly defined routes for cyclists, roller-bladers and skaters next to routes for walkers and runners all types of activities where catered for. A great way to see the park is by renting a bike for the day. The park is very flat so even the most novice cyclists will have no problem getting around – all trails are clearly signposted. There are also organised cycling tours you can take with a group to get the best out of the park. For instance, the Vancouver City Tour which includes the park, always gets great reviews. In the centre of the park are a number of attractions including the Vancouver Aquarium and the Stanley Park Theatre Under the Stars. A highlight for us was to catch an amateur rugby game played at the Brockton Oval field house, an unexpected treat to see in North America. Stanley Park features an number of statues such as the Girl in a Wetsuit and a Statue of Scottish poet, Robert Burns. Also there are some internal lakes such as the Beaver Lake and the lost lagoon that make for interesting picture points. Stanley Park is a sanctuary to escape the pressures of city life for the people of Vancouver and visitors. It offers multiple leisure activities, sea views and staggering natural beauty. The Vancouver Hop-on, Hop-off Trolley Tour stops at Stanley Park.